Steve is a simplified and totally organic animated silk suitable for all lighting conditions, indoors or out. The easy to build and easy to operate gimmick allows you to bring any silk 12" or larger to life. Carry this in your pocket and you are ready to go at all times. Great as a quick "hey check this out" between routines or with some creativity, a featured animation perfect for all performing situations. 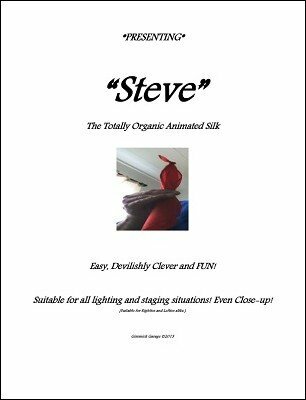 Steve is so easy and fun you will catch yourself passing your free time with "Steve" in hand!